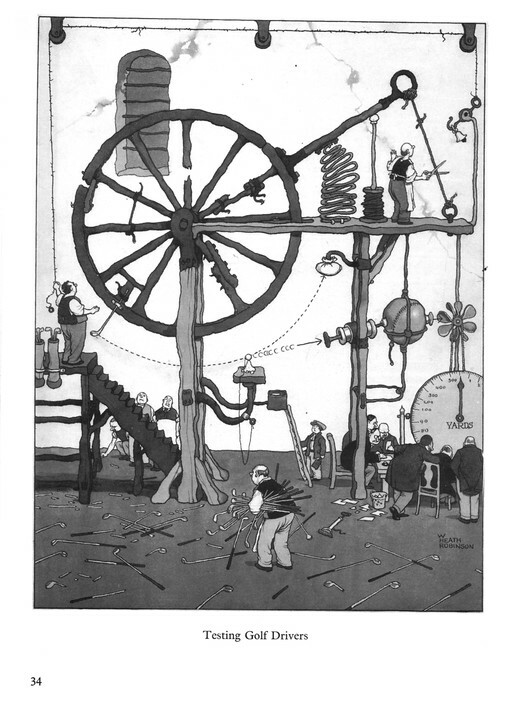 W. Heath Robinson's Inventions - I was thinking the other day about Heath Robinson and his splendid inventions, having seen some of the works of Rube Goldberg and been distinctly underwhelmed by them. One thing led to another, and I soon discovered that the Wikimedia Commons had scanned the entire, out-of-copyright contents of the same Heath Robinson book as owned by my grandfather. With cartoons depicting humorous solutions to both World Wars to solving the problems of communal living, via inter-war sports, manufacturing and transportation, I love how the people depicted are all so terribly serious about it all - these inventions are important, and not to be laughed at. Wintergatan - Marble Machine - speaking of Heath Robinson, have a Terribly Serious Swede with his fully functional but ridiculously over-complicated, ball bearing-operated music machine. Here is your ear worm for the day - annoyingly catchy. The Telegraph Pole Appreciation Society - in their words, "glorious everyday mundanitude of these simple silent sentinels the world over". May include electricity pylons. John Finnemore's Souvenir Programme - You Are Not A Geek - many here will understand the sentiment behind this sketch, from the remarkable John Finnemore (and Radio 4). Those W. Heath Robinson inventions reminds me of an invention of my own from when I was little. I made a 'machine' to dispense a pencil and paper when you wanted to draw something. It was a box with a clip at the top that released a piece of paper, and a lever on the side that pushed a pencil off a pedestal to a dispense area below. It took far longer to reload with paper and a pencil afterwards than it would've taken to just to get them in the first place, but I was terribly proud of it. It had a name and everything. Couldn't figure out why nobody else was impressed.